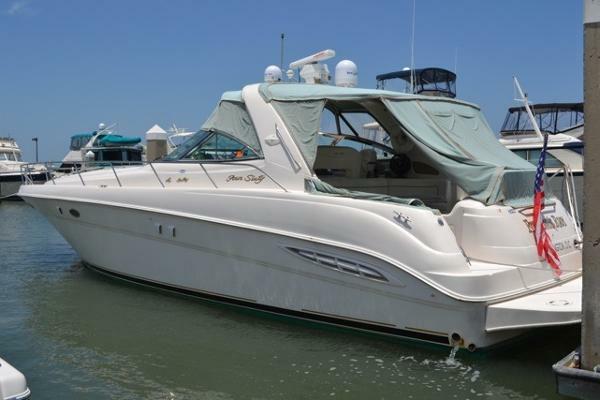 2005 Sea Ray 460 Sundancer **Recent 30K Price Reduction** This is the 460 you have been looking for! Fully equipped and impeccably kept. "De Liefte" is a beautiful blue hulled 460 with all of the improvements and upgrades that come with being a late production model. Features On-Board Include:Vetus BowthrusterHardtop w/ Full Camper Enclosure & Slant-back EnclosureKVH Sat TV w/ Receivers in Cockpit, Salon, Master & Guest StateroomsCockpit Flat Panel TVCockpit ACCockpit Wetbar w/ Sidebar Liquor DispenserCockpit Fridge - NorcoldFULL Raymarine Electronics Package incl/ Radar, Plotter, Autopilot, VHF, etcHardtop Mounted Backup Camera w/ helm monitorGlendenning 50amp CablemasterWasher/Dryer ComboUpgraded Cherry Interior If you are in the market to move up, do not hesitate to contact us regarding this extraordinary opportunity. 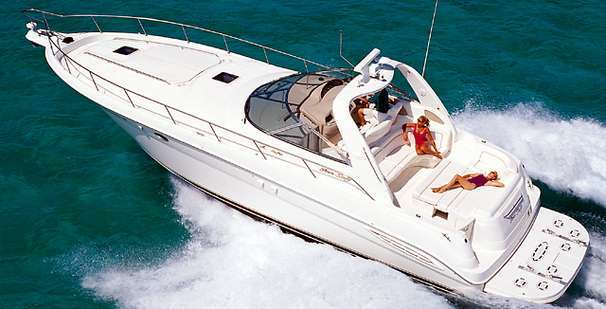 No other 460 Sundancer on the market can compare!! 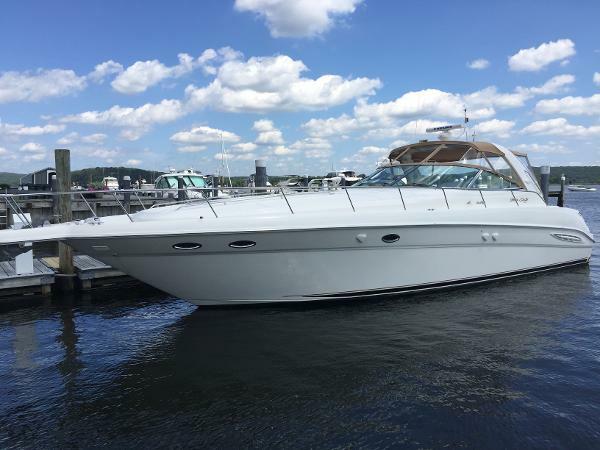 2000 Sea Ray 460 Sundancer You wont find a more sophisticated styling and luxurious accommodations then in this fresh-water SeaRay. 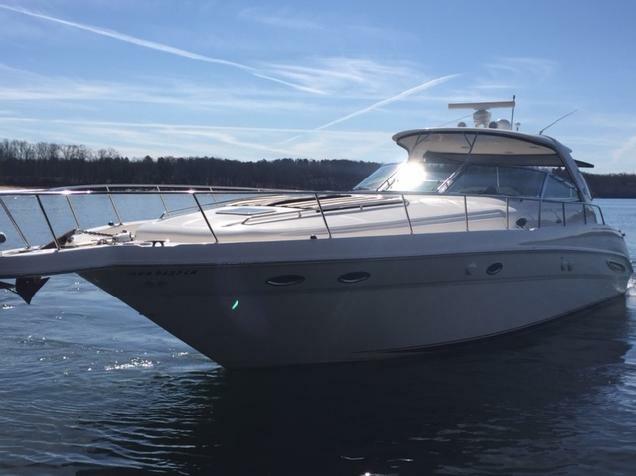 Its loaded with options including touch screen Raymarine radar, upgraded stereo, electric extended swim platform; low hours and LIKE NEW condition. Call for showing. Engines: Twin Cummins 6 CTA, 450 HP each; V-Drives, 424/423 hrs; Fuel Cap: 400 gallons; Generator: 858.3hrs; LOA: 514; Beam: 148; Weight: 28,000; Fresh Water Tank: 100 gallons. Accommodations: Queen sized stateroom with shower and vacuflush head; mid-cabin queen berth; vacuflush heads with separate shower; hot & cold transom shower; salon with electric sofa; 32 Samsung TV; DVD w/Bose surround sound; major upgraded stereo; Alpine Marine CD receiver w/JL Audio speakers and subwoofer throughout. Galley: 3-burner electric range, microwave, refrigerator/freezer, coffee maker, sink, and washer and dryer. 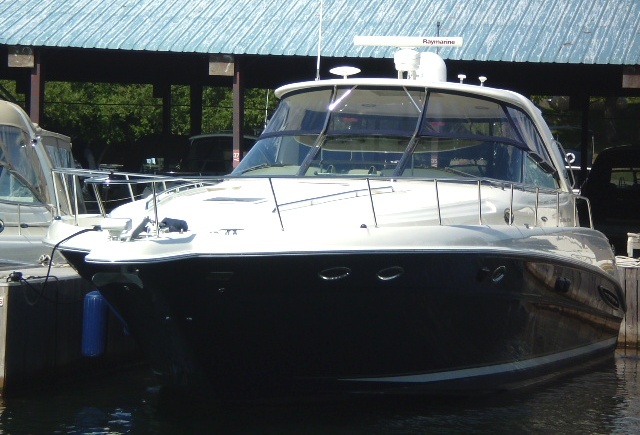 Elec/Mech: 2 A/C-Heat, windlass, Raymarine Hybrid Touch Radar, depthfinder, synchronizer, Trim Tabs, VHF, halon, closed cooling, water heater, battery charger and arch tower. Deck/Hull: Pulpit/anchor, Dock power w/electric cable master, compass, fenders, racks, spotlight, W/S wipers, shore water, wet bar w/sink and ice maker, Bimini top, enclosures, sunpad, swim platform w/lift and cockpit carpet (not pictured) Some trades considered. 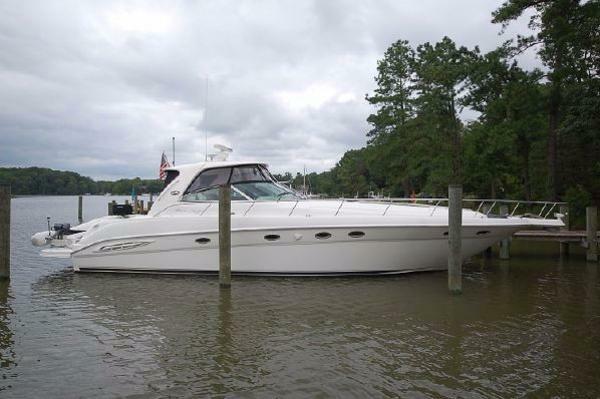 2000 Sea Ray 460 Sundancer Just listed. 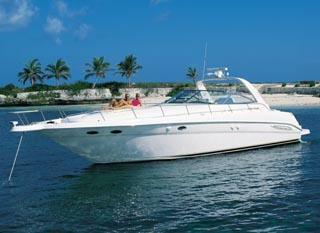 Cleanest Sea Ray 460 on the market. Always winter stored inside. No disappointments. The private mid-stateroom coddles passengers with an electric convertible sleeper, voluminous storage space, and entertainment from the TV/VCR/radio combo. 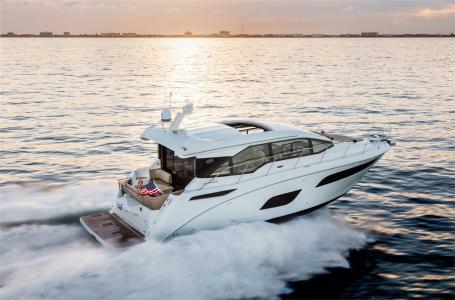 The luxurious helm area pampers the captain with a custom slide/swivel seat with armrests, Euro-style companion seat, wood-accent steering wheel and a full array of instrumentation including Raytheon electronics. Theres spacious U-shaped cockpit seating with an electrically actuated retractable sun pad, and movable cockpit table. A tasteful lighting scheme, handcrafted wood finishes, and custom drapes and miniblinds add elegance to a spacious cabin. The salon sofa converts into a sleeper, and theres a standard washer/dryer. The large galley is fully equipped for hungry seafarers, with a three-burner stove, microwave, refrigerator/freezer, and coffeemaker. Please go to "Full Specs" for details. 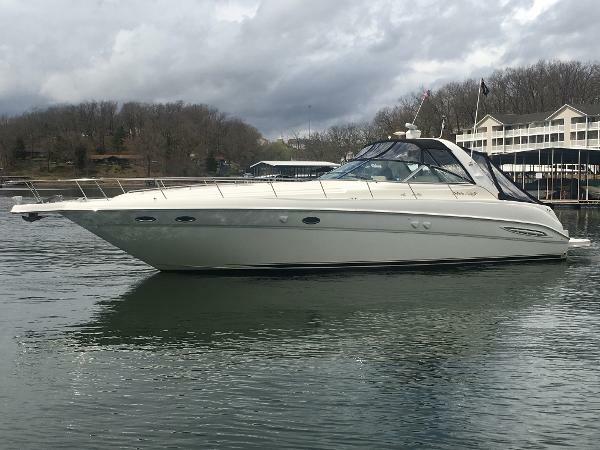 1999 Sea Ray 460 Sundancer This 1999 46' Sea Ray Sundancer is powered with desirable 425 hp Volvo diesels. She is nicely equipped with generator, SAT TV, electronics and lots of extras. Seller is looking for offers! 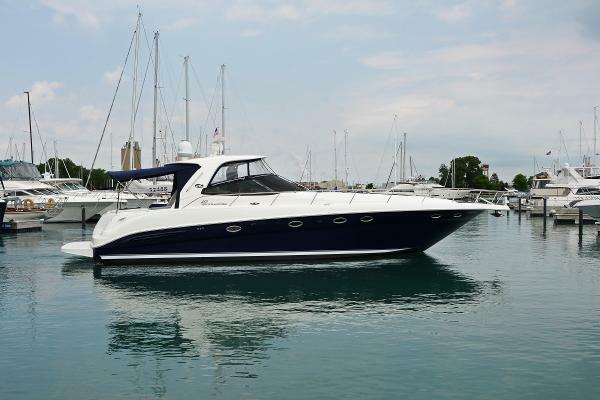 2001 Sea Ray 460 Sundancer The Sea Ray 460 Sundancer is easy to handle and superbly seaworthy. Belowdecks, there is a luxurious interior with two private staterooms, two full heads and room to sleep many friends. Standard power includes twin Caterpillar engines. 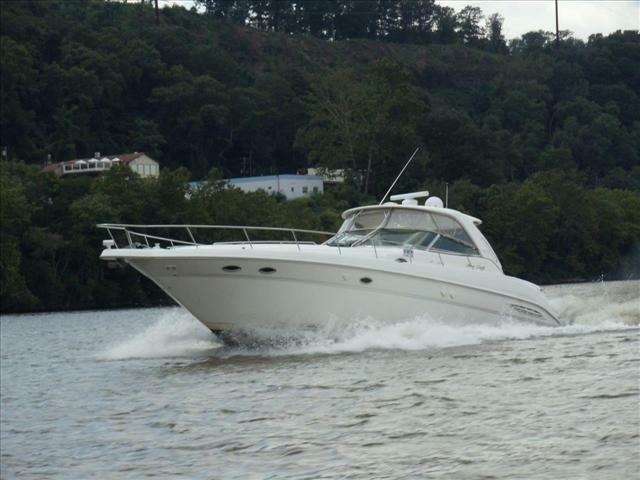 2001 Sea Ray 460 Sundancer, Beautiful, 1 owner 2001 Sea Ray 460 DA. 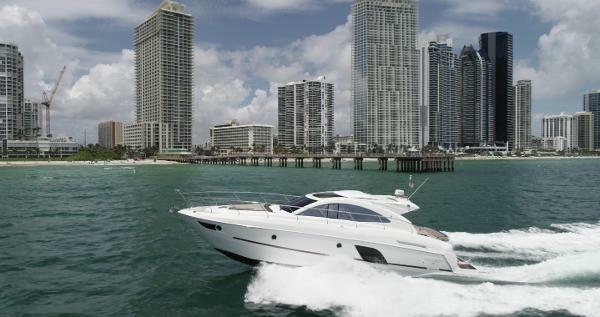 Stylishly and spaciously designed with you the owner in mind by Sea Ray. 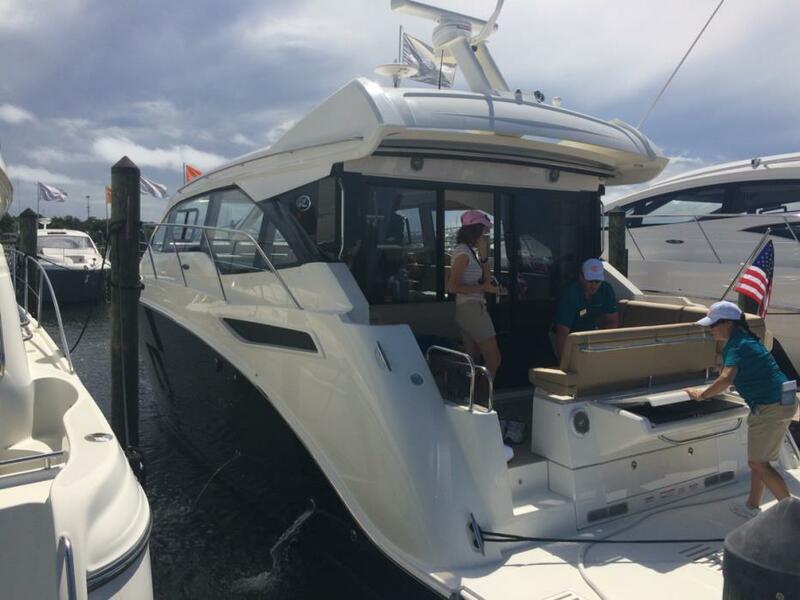 Great ride and comfort on a classic 460 SunDancer with a hard top! Powered by twin Cummins 6CTA Diamond Performance series engines with 900 total horsepower with only 750 hours. Some of the accessories and options include:8 KW Westerbeke generator with sound shield, hydraulic swim platform, A/C with reverse cycle heat, Hard top, radar, chart plotter, gps and auto pilot, tri data, cockpit t.v., new isinglass and aft cockpit curtain and much more! In the water for easy viewing! Foam-filled fiberglass stringer system. 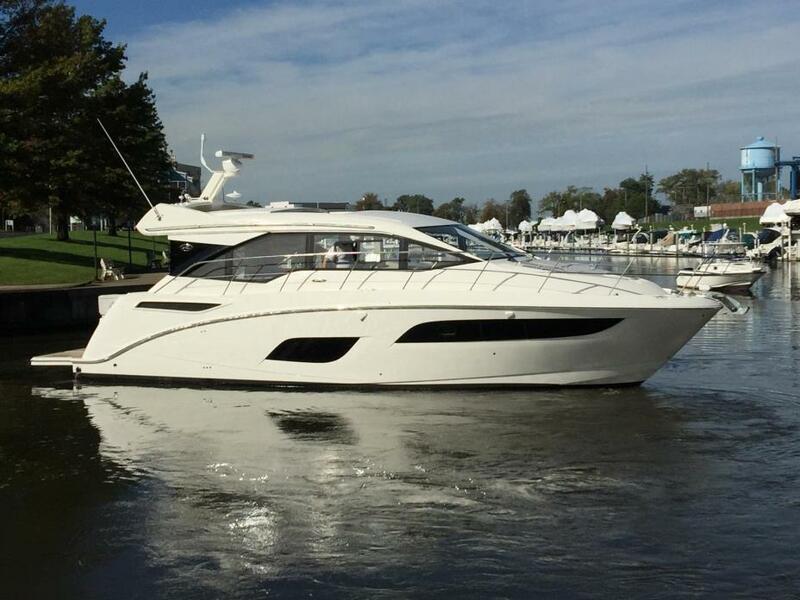 2017 Sea Ray 460 Sundancer, There are too many features on this boat to list them all. Here are some highlights: Spacious salon with galley and seamless transition to cockpit, gigantic pantry, opening window at helm, L shaped salon sofa converts for more sleeping accommodations, full-beam midship master suite, second head, foreward stateroom berth scissors apart for two separate beds or together for one large one.